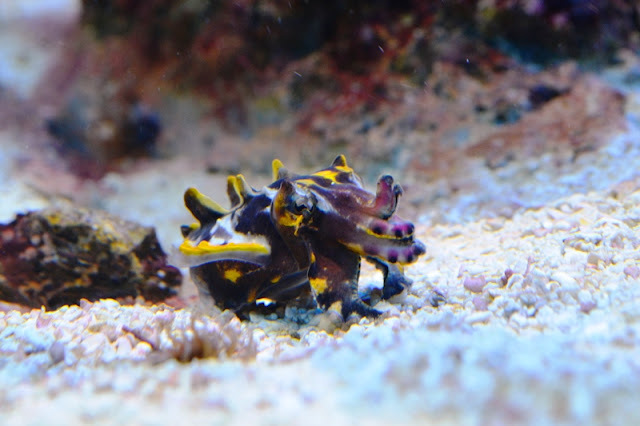 We're thrilled to introduce you to our very first home-grown flamboyant cuttlefish! This solo cuttlefish was the only one to survive to maturity — no small feat since the Aquarium is only one of a handful of aquariums across the country to successfully rear this species. It is on display in the vibrant Living Corals exhibit. Look for it crawling along the bottom by the euphyllia (hammerhead coral) or resting mid water on the rock work. Yup, this little guy gets around! at the waterline, or anywhere in between! 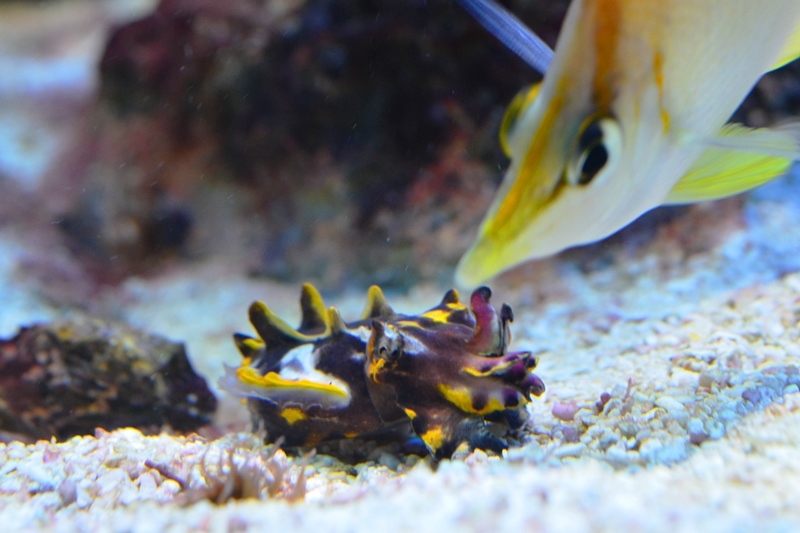 Like all cuttlefish, it can change color in the blink of an eye from drab browns to vibrant purples and yellows. When it is hunting, it'll shoot out a pair of clear, retractable tentacles to grab its prey. The menu includes tiny live mysid shrimp and juvenile grass shrimp. As soon as a fish comes along, "Watch out, I'm poisonous!" Full size flamboyant cuttle fish grow up to three inches long, this little cuttlefish is barely an inch long. But last fall it was barely the size of your pinky nail! Here's the cuttlefish as a wee hatchling, barely the size of your pinky nail! 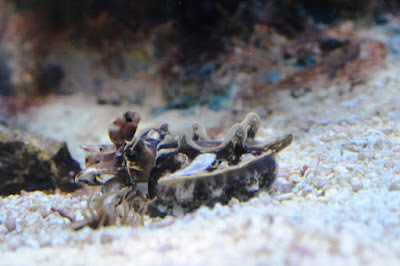 The New England Aquarium is one of very few places that exhibit this species in a living reef habitat. These animals are so exquisite, they're usually on display all by themselves. So it's exciting to see them in a vibrant reef habitat. 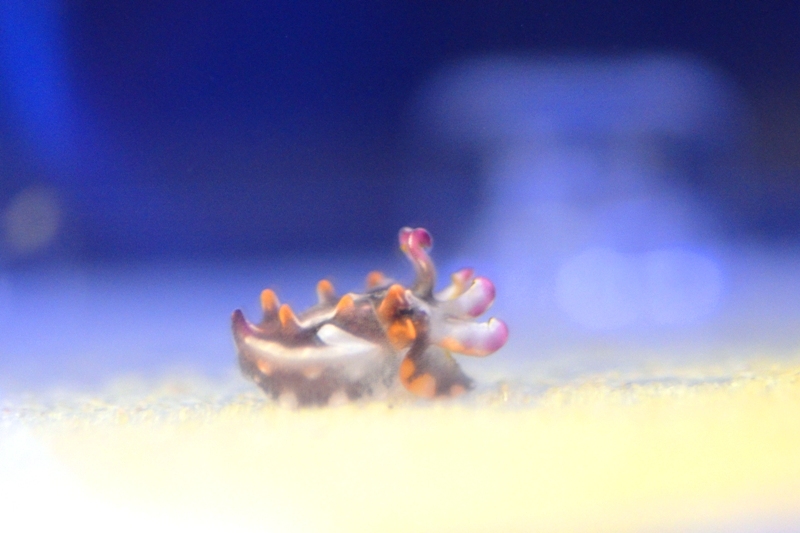 Come see one of our tiniest tentacled residents as Tentacles take hold at the Aquarium this summer! Egg Veil 2016: She's done it again!